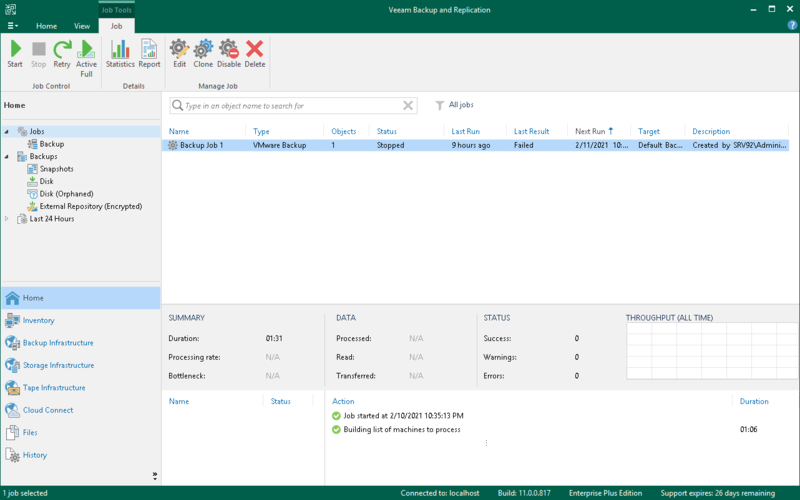 Operation commands in Veeam Backup & Replication are organized in logical groups and displayed under tabs on the ribbon. The ribbon is displayed at the top of the main application window. The Home tab provides quick access to the most common operations. It lets you configure different types of jobs, perform restore and import operations. This tab is always available, no matter which view is currently active. Other tabs contain commands specific for certain items and appear when these items are selected. For example, if you open the Home view and select a backup job in the working area, the Job tab containing buttons for operations with jobs will appear on the ribbon. If you open the Files view and select a file or folder, the File Tools tab containing buttons for operations with files will appear on the ribbon. Commands for operations with items in Veeam Backup & Replication are also available from the shortcut menu. You can minimize the ribbon. To do so, right-click anywhere on the ribbon and select Minimize the Ribbon. To restore the ribbon, right-click on the minimized ribbon and clear the Minimize the Ribbon option.